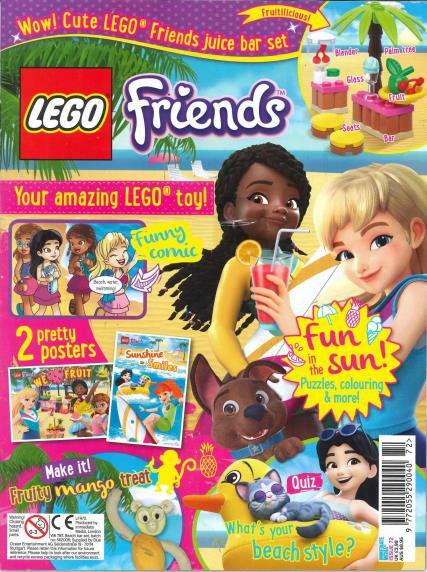 Lego Friends Magazine is aimed at children between the age of 7 and 11. Featuring fun brain-boggling puzzles and super cute stories. There are even colouring in sections scattered throughout the magazine, allowing the reader to express themselves. Every issue of Lego friends comes with a free mini doll and an awesome 16-page friendship house comic. Buy a single copy or subscription to Lego Friends magazine. Lego Friends magazine has two free pretty posters inside. As well as showing the reader a really cool recipe to try out, it may be a cute cake or colourful cookies. Lego Friends magazine has so much fun content inside, it’s sure to be the next big magazine for any child. Bought as a gift for my 6 yr old grand-daughter, she really looks forward to this magazine being delivered. My daughter loves it, the free gifts, competitions and the story's. My 6 year old granddaughter loves it. This was my first issue, and it did not disappoint. My girls loved it and I would definitely order again. great magazine. I get one and then I have finished it. I can not wait for the Halloween special and I wish it came out now. I abosolutley love the toys and have got over 100! Excellent mag. Great that child has something really entertaining to look forward to each month. The little kit is so much better than what other mags offer.